The project is dedicated to the material and social memory of those who were suffering from the Great War. ensuring due protection for the unique material warnnings such as the terrain forms burdened with the troubled past and war cemeteries for the benefit of future generations. The ‘Gas-scape’ goes far beyond the mere theatre of war, the stage on which ‘killing culture’ was born. It is also the scene of on-going, post-depositional and hopefully pro-social (cognitive, artistic, pop-cultural but also non-human and so on) processes. It is tilted towards the future, as a warning, but also an inducement to think, with the support of archaeology, of reconciliation. It can also be seen as a touchstone of the actual potential of ALS when it is applied to the cognitive process as well as other pro-depositional processes – providing support to protect the in situ existence of that complex, causative and meaningfully palimpsestic landscape scarred by World War I. To keep Russians on their toes and convinced that the attack was continuously ongoing, the 9th Army was ordered in late January to attack with full force in the area of Bolimów. With that in mind, the High Command issued 18,000 shells for our use, gas ammunition to be precise. It is important to understand, in the context of those times, that such a vast amount of ammunition was something quite extraordinary (Duncker and Eisermann 1927: 42). The Germans’ next attempt to use gas took place four months later, shortly after the first large-scale military use of poisonous gases near ypres in Belgium on 22 April 1915. On 31 May 1915 chlorine was deployed in the area between Majdan and Zakrzew, where the Germans placed 1,200 steel canisters along the frontline and released 240 tonnes of heavier-than-air chlorine. This was done by a special gas unit, Pionier-Regiment Nr. 36 led by Colonel Goslich, which, like Pionier-Regiment Nr. 35 led by Colonel Peterson, consisted of scientists, chemists and chemical industry workers. Zalewska A. (2013) Roadside Lessons_ Roles, Meanings and Efficacy of the Material Remains of The Great War at former Eastern Front. The area in question is a moraine denudation plain (Kondracki 2002:190) which forms one of the flattest landscapes in the Mazowsze region – a fact that undoubtedly contributed to its selection as the site of early chemical weaponry use on the eastern front. The river Rawka cuts meridionally across the research area. Still unregulated, in many places, particularly between the villages of Kamiony and Bolimów, the river follows a deep ravine with banks as tall as 10 meters. Past Bolimów and all the way to the river’s estuary, the Rawka ravine becomes wider, shallower and significantly less steep. In 1915, it was the river of Rawka itself along with its ravine that constituted the “No Man’s Land” along the section of the frontline between the village of Kamion, through Ruda and Budy Grabske, and eventually to the village of Ziemiar and the former Mogiły manor, at which point the frontline swerved to the east and away from the river. Between Wola Szydłowiecka and Humin, the “No Man’s Land” included a section of a minor watercourse called the Chełmna. From there, to the village of Sucha, No Man’s Land overlapped with a stretch of arable land and ignored the other small watercourses in the area. The landmarks that may help to delineate the former frontlines in the area include the road between Humin and Kurabka as well as the manor in Borzymówka. To the north of Bolimów, two small watercourses eventually flowing into the Bzura cut across the research area from the north-west to the south-east. The frontline would later stabilise against an approximately 2.5 km stretch of the tiny Sucha rivulet located somewhat to the south. The Pisia river flowing in roughly the same area played no part in the frontline stabilisation of 1915. The last section of No Man’s Land of particular interest to us covered the area of the Bzura ravine from the mouth of the Sucha near the village of Zakrzew and all the way to Sochaczew. The river follows an almost perfectly meridional channel here with only a slight deviation to the east. Approximately one third of the research area is currently forested (some 110 km2). A reconstruction of the pre-war landscape based on a copy of a 1:126,000 Russian map (a so-called “three-verst map”) dated around 1914 reveals a forested area of approximately 120 km2 which almost perfectly overlaps with the forests existing nowadays. The Great War resulted in a number of violent transformations of the surrounding landscape. The Archaeology of Modern Conflicts have over the last decades been systematically implemented in western European countries, mainly in Belgium, France and England. The results of such studies not only enrich our knowledge of the events that transpired a century ago, but also deepened respect for the material relics of the past, awoken sensitivity, and shaped historical awareness of those interested in it. In our project we try to elaborate the concept of socially useful archaeology (such as archaeology of reconciliation and / or archaeology as the antidote to vandalism and / or archaeology which provides the stimulations for reflection, a.o. by exposing / presentyfying spatially extensive warning monuments. Projects of this type inspire considerable social interest and naturally translate to efforts aimed at advancing the due protection and preservation of the material relics of the recent past. However they can also stimulate mutual understanding between descendants of the once fighting each other sides via reflective approach to remains of war including cultural tourism, educational projects etc. Meanwhile in Poland, the problems of World War One Archaeology (or more generally: issues related to the material and mental remains of 20th c.’s conflicts) continue to be marginalised. Our research team is created to answer the urgent need to establish a new sub-discipline of archaeology dedicated to the problems, phenomena and concerns that have been so far neglected to the great detriment of science, society and the historic substance of relics of the recent past. For indeed, we are now witnessing a greatly accelerated process of ongoing decay of the material remains of 20th century conflicts, which has intensified over the last ten years due to progressing industrialisation of forested and rural areas, as well as through the activities of so-called detectorists. 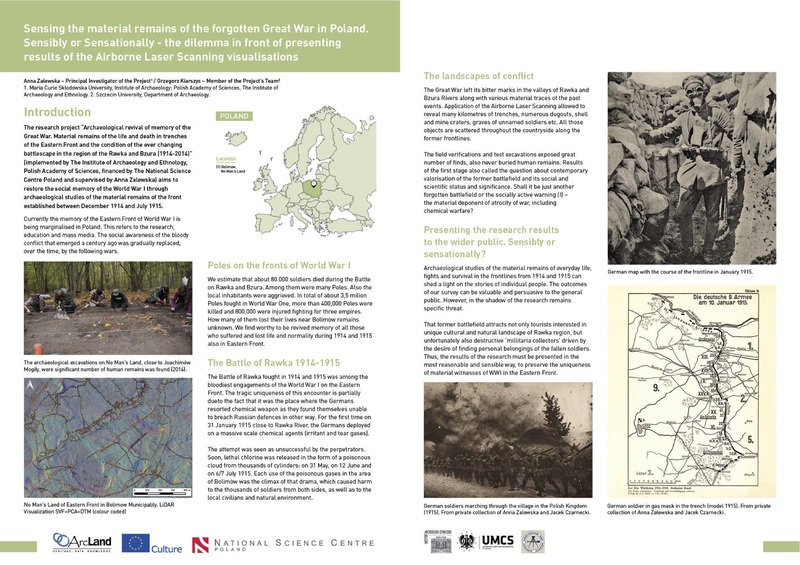 Members of the research team devoted to the performance of these innovative research comprise a group of specialists deeply convinced of the viability of the efforts to study and preserve the material remains of the Great War, and of the need to disseminate the popular knowledge of this unique turning point in history. Members of the team were carefully selected on the grounds of their competence, field-work experience, and willingness to participate in introducing a new quality to the field of archaeology in Poland. We have started the fieldwork at the beginning of August 2014 and will finish our project with the publication in 2018. “A hundred years ago Bolimow, a small peaceful town in Poland, was the site of a bloody World War I battle. 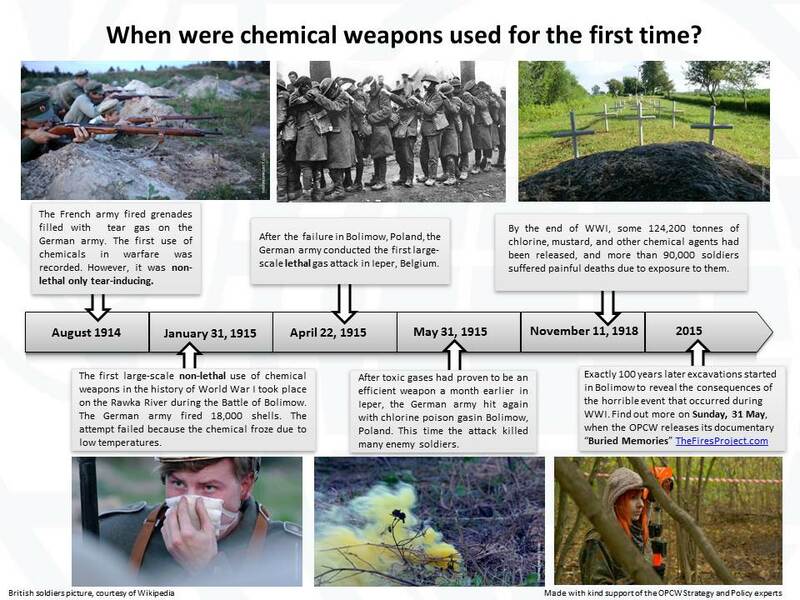 Encouraged by its success at Ypres, the German Army used chlorine gas as a weapon at Bolimow – the first time chemical weapons were successfully used on the Eastern Front. A hundred years have now passed. Committed to never repeating the horrific experiences of World War I and elsewhere since then, 190 countries are working under the Chemical Weapons Convention to rid the world of chemical weapons. Despite having so far eliminated almost 90% of declared stockpiles, including in Syria amid a bloody conflict, allegations of chemical weapons use persist, and the spectre of chemical terrorism is looming ever larger. Has humanity really learnt the lessons of Bolimow? 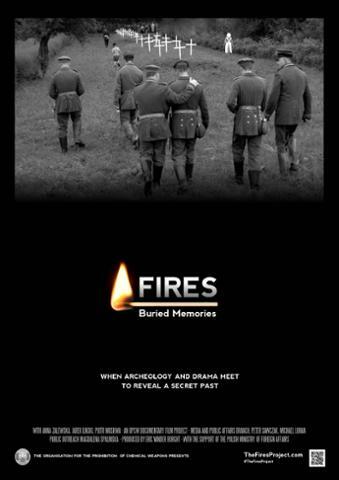 The movie “Buried Memories”, part of ‪#‎TheFiresProject‬ has been released! It will bring you back to the Bolimów battlefield where 100 years ago the German army used chemical weapons for the first time on the Eastern front, shortly after the first large-scale lethal chemical weapons attack in Ieper, Belgium.